These high-quality magazines for your Smith & Wesson M&P 15-22 give you smooth operation and feeding because they come directly from Smith & Wesson. Built with rugged, self-lubricating molded polymer components, including one-piece body, follower, and removable floorplate, plus a precision wound steel spring. Load-assist button for fast reloads, and viewing slot to show you exactly how many rounds you have left. SPECS: Reinforced injection-molded polymer. Approx. 8¼" (21cm)" long, 7⁄8" (2.2cm) thick. Fits M&P15-22. Available in 10 or 25-rounds. For 22 long rifle ammunition. Here is the down low on this magazine. Functions perfectly. Loading is a royal pain because of some pinheads decision at Smith and Wesson. 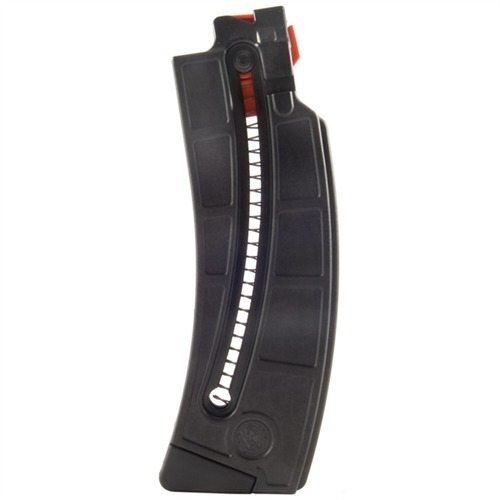 The 10 round short magazine and the 25 round magazine both have a magazine loading button that allows you to pull down on it while loading to make it easier. 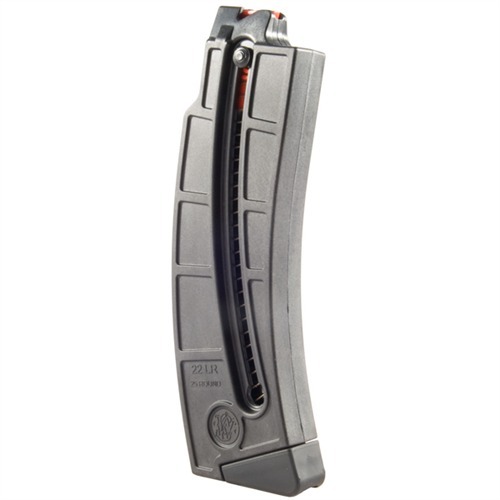 This magazine does not have one so you have to load the rounds by pushing the narrow 22lr rounds down upon each other. Its hard on the fingers and makes loading a pain. I complained to S&W and they said they couldn't install one due to this mag being limited. I did it with a little elbow grease and re-limited the mag. If your buying a 10 round mag buy one that was designed to be a 10 round mad and since once is available why put up with sore fingers. And when your using these magazines for PD trainers its a lot of pushing rounds. The only reason to buy a 10 round this long would be for looks. The family has a couple of .22 rifles, one from Smith & Wesson, the other from another major name. By far the Smith & Wesson magazines are easier to load and unload and are a better value for the money spent. You can't go wrong with this Smith & Wesson product. This M&P 15-22 magazine is exactly what came with the gun when I bought it new. Works perfectly. I'm the type of person who would pay more if it meant better service. In this case, I didn't have to pay more for great service and a great product. The magazines arrived safely in 2 days and are exactly what I expected; quality factory magazines. This was my first time ordering from this company and now they have a new happy customer. Unloaded it and then discovered the follower was upside-down. I removed the baseplate and spring flipped it and reassembled it. So far it functions flawlessly. Bought seven of these because they were discounted. Put 25 rounds in each, and didn't have a single FTF, even with rapid fire. I love how easy it is to load with the thumb assist. I bought several of these 25 round , and 10 round Mags a few years ago. For a personal 22LR build on a Mil-spec AR upper & Lower . 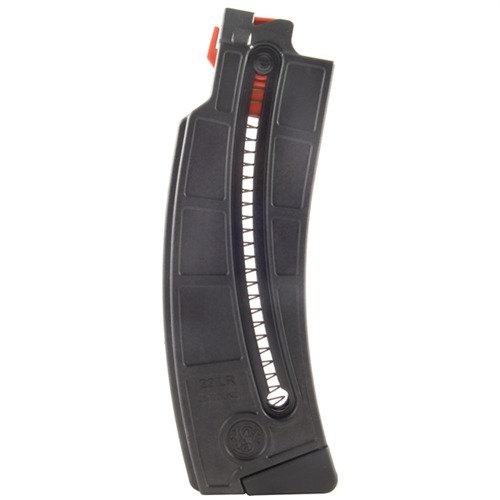 This was one of the first 22 LR AR style Mags to be designed with a last round hold open . They work just as described in my build . Never a hiccup . These Mags are reasonably priced , and easy to find . The most fun to shoot 22 LR I own. My Wife loves it ! 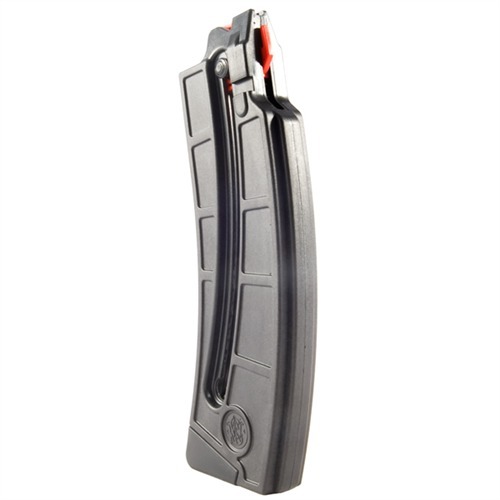 Mfr Part: 199240000 022188143362 These high-quality magazines for your Smith & Wesson M&P 15-22 give you smooth operation and feeding because they come directly from Smith & Wesson. Built with rugged, self-lubricating molded polymer components, including one-piece body, follower, and removable floorplate, plus a precision wound steel spring. Load-assist button for fast reloads, and viewing slot to show you exactly how many rounds you have left. Mfr Part: 199230000 022188143379 These high-quality magazines for your Smith & Wesson M&P 15-22 give you smooth operation and feeding because they come directly from Smith & Wesson. Built with rugged, self-lubricating molded polymer components, including one-piece body, follower, and removable floorplate, plus a precision wound steel spring. Load-assist button for fast reloads, and viewing slot to show you exactly how many rounds you have left.